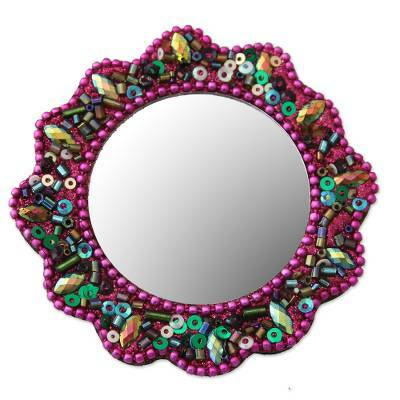 Small Round Hand Mirror Embellished with Beads and Sequins, "Festivity in Fuchsia"
A festive array of colors comes together on this petite hand mirror from the NOVICA India Market Picks collection. Perfect for purse or pocket, the round mirror is lavishly embellished with beads, sequins and faux acrylic gems. The reverse side is plain black wood. Frame: 0.6 cm H x 7 cm Diam. Frame: 0.2" H x 2.8" Diam. NOVICA Market Picks India represents a variety of handmade crafts from Indian artisans. You'll find great gifts at incredible prices and you will be helping artisans at the same time. Happy shopping!